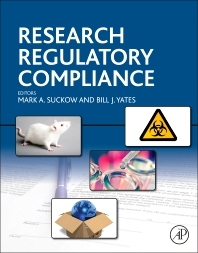 Research Regulatory Compliance offers the latest information on regulations and compliance in the laboratory. With the increasing complexity of regulations and need for institutional infrastructure to deal with compliance of animal use issues, as well as a requirement surrounding human subjects, this publication provides reputable guidance and information. The book is extremely helpful as a resource for researchers, administrators, and technicians in the laboratory, and is also a great asset for faculty or new researchers coming in to the laboratory environment. It will help prepare users for the deluge of regulatory and compliance issues they will face while conducting their scientific programs. The book is edited and authored by known leaders in the field of compliance and regulations, and contains extensive research on the topics. It represents the new standard for information in every laboratory. Researchers, administrators, institutional officials, and technicians working in laboratories using animal and human subjects. Associate Vice President for Research, Attending Veterinarian, Professor, Biomedical Engineering, University of Kentucky, Lexington, KY.